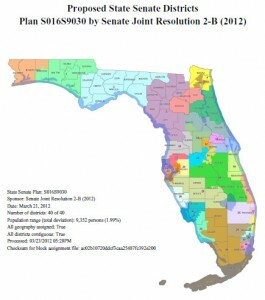 The Florida Supreme Court will hear arguments on April 20, 2012, on whether the legislature’s state senate map passes muster under Florida’s Fair Districts Amendment. The Supreme Court previously rejected the senate map, but approved the legislature’s house map. If the court rejects the redrafted senate map, the court will be required to draft the senate map itself. Meanwhile, a state circuit court in Tallahassee is considering challenges to the U.S. Congressional map drafted by the Florida Legislature. The plaintiffs in that case allege that the congressional map violates the Florida Fair Districts Amendment. Previously, federal courts rejected claims that the process used to draft the congressional redistricting map violated the U.S. Constitution. Given that filing deadlines for candidates are rapidly approaching, a decision in both cases is expected soon. This entry was posted in News, Redistricting and tagged fair districts, florida election attorney, Florida election law, florida election lawyer, florida election problems, redistrict, redistricting florida, redistricting florida litigation, redistricting maps, Thomas Shults, Tom Shults. Bookmark the permalink.